Bournemouth is a town on the South coast of England in the UK. The town is a popular tourist resort, in large part due to its seaside location and sandy beachs. 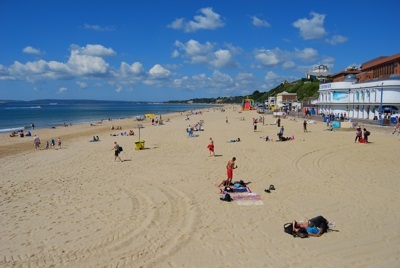 As of 2005, Bournemouth had an estimated population of 163,600. Bournemouth is coastal resort town on the South coast of England. To the West of Bournemouth is The Jurassic Coast. Bournemouth was founded in 1810 by Lewis Dymoke Grosvenor Tregonwell, and became a recognized town in 1870. Due to its sandy beaches and nightlife, Bournemouth is a popular destination for tourists. More than 5 million tourists visit Bournemouth each year. Bournemouth is home to the Bournemouth International Centre (BIC), one of the prime venues for conferences, exhibitions, events, and entertainment in southern England. Bournemouth Pier is near the town center, and is a very popular tourist attraction. Boscome Pier is to the East, the suburb of Boscombe, and is actually the larger of the two. A popular challenge for sea-swimmers is swimming from Bournemouth Pier to Boscombe Pier, a distance of 1.4 miles (about 2.25 kilometers). Each year, the British Heart Foundation, the UK's leading heart charity, manages an organized swimming event from pier to pier, which attracts hundreds of swimmers.